Marlin Jackson was onboard a Delta flight from Atlanta to San Diego on Sunday, sitting in a window seat on the left side of the aircraft. The passenger in the middle seat in his row was traveling with an emotional support animal — a dog weighing about 50 pounds. The dog was sitting in the passenger’s lap. I mentioned this story on Tuesday. Mr. Jackson sat in his window seat while the dog reportedly growled. Since he was sitting in the window, he was pinned in when the dog attacked — twice, reportedly for 30 seconds. 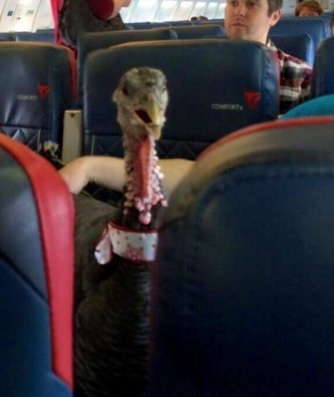 Pets flying in the cabin usually cannot be more than 17 pounds and must be inside a carrier underneath the passenger’s seat, although given risks imposed on airlines by the Air Carrier Access Act they’re reluctant to push back on passengers (let alone charge them, like they do for pets) who claim to need whatever animals they wish to bring for ’emotional support’ reasons. In this case the dog caused real damage — apparently puncturing the passenger’s lip and gum. He received 18 stitches. It is troubling that an airline would allow a dog of such substantial size to ride in a passenger’s lap without a muzzle. Especially considering the dog and its owner were assigned a middle seat despite Delta Air Lines’ policies that call for the re-accommodation of larger animals. We expect airlines to follow procedures as required and verify any dogs travelling unrestrained in the open cabin are trained for handling the large crowds and enclosed environments encountered on board an airplane. Ultimately I’m perfectly well in favor of pets traveling in cabin when they need to provided they follow rules for safety. My yorkie is too old to travel well at more than 15 years old, but on rare occasions he flew — and flew well. Here he is at the Dallas Fort-Worth D terminal pet relief area during a connection (connections afford the time for a potty break). I believe pet in cabin policies should be more liberal than they are currently, and that cost and restrictiveness have led to the explosion of using the claim of emotional support as a justification to avoid those rules. The solution likely lies in simultaneously cracking down on ‘anything goes’ with emotional support animals and extreme restrictions on pet in cabin. Require that in all cases that they remain inside a carrier while inflight. However there shouldn’t be a pet in cabin fee, and certainly not one that’s often higher than the cost of the passenger’s ticket, since the pet takes the place of the passenger’s allowable carry on bag anyway. It’s reached the point where we need a solution that no longer encourages passengers with animals to cheat the system through a giant legal loophole. If this person attacked the passenger on the street with a dog he would go to jail and the dog would be put down. But on an airplane you have a bunch of people supporting him and his rights but the passaenger who is mauled and mained for life is the problem? You defenders are seriously deranged. The man with the dog should never be allowed on a flight again and be prosecuted to the highest degree possible. He purposely brought the dog on the flight and directly caused an attack. I work for an airline and have worked at the gates boarding.. I had a passenger once who had two Cavaliers and said they were both ESA’s and had a letter, but we all know that these some letters are made up to look authentic or pay to get them on the website..
We have a pet desk department that has to pre authorize the documents and actually make the booking.. I think the idea of having the passengers be held accountable for their pet..
An ESA is supposed to also be able to be trained to obey in order to have their certification. I myself have 4 dogs and know how they are around people.. I don’t like the thought of having to crate my dog and ship as cargo either so my rule is “If I can’t take them with me, they stay home”! I love animals but I don’t want to see anyone hurt either.. we just do our job and if a passenger has an ESA with their documentation, we are not allowed to question.. I can’t speak for all airline agents but there are guidelines we follow.. there are laws that we cannot question but follow.. Emotional support animals do not have public access. Simply put: Where pets are not allowed, emotional support animals are not allowed. Not restaurants. Not malls. Not libraries. Not the local hardware store. The Civil Aeronautics Board, however, has ruled that a passenger may fly with his/her pet if he/she has a Physician’s note stating that he/she benefits emotionally from the animal. No proof of training or certification is required. Such a requirement would help ensure that the team won’t be a nuisance to the public. Service dog teams on the other hand have public access. They are trained professionally and are usually certified by Assistance Dogs International (ADI). To ensure they are capable of performing the tasks for which they have been trained, teams are continually reevaluated for as long as they remain a team. Teams carry upwards of $3 million of liability insurance. Dogs wear a cape (in rare cases, a bandana) displaying the name of the organization that trained them. Handlers carry ADI team photo identification typically displayed on a lanyard worn by the handler. Dogs are not overweight. They do not eat food off the floor. They do not react to other animals. They do not interact with people unless directed to do so by the handler. Dogs do not sit on furniture. Teams do not invade the personal space of others. They are essentially invisible. Until the CAB requires certification for ESAs the flying public will remain at risk. No animals whatsoever inside any airplane cabin. A 737 or an A320 is not Noah’s Ark! What started out many years ago as a blind person having a seeing-eye dog has gotten totally out of hand. The only fair and reasonable way to handle this is to put all service/emotional support animals in carriers and then in a (climate/pressure controlled) baggage hold. Sorry but this is the best fix we have. And no, I am not an animal hater. I simply choose not to travel with my emotional support alligator! –However, I am allergic to them. Sitting next to a dog on a long trip would be unpleasant for me. –Hypoallergenic dogs, please give me a break, I am allergic to them too. –Over-the-counter allergy pills, they lesson the symptoms, but with prolonged exposure, they do not work either. In addition, they make me feel awful. –I love cats too, but I am even more allergic to cats. –If I am sitting next to a dog or cat, I should have the option of being moves to a less allergic seat, for medical reasons. –Many pet owners treat dogs like people. They are not trained properly. They bark, pee on things, jump on people, growl, run around, chew on stuff, and bite. –What do you do if the dog need to go to the toilet. Let it go in the aisle and clean it up like in the streets of New York. Maybe put down some doggy litter. –I am just imagining falling asleep and finding out that someone’s emotional support dog is chewing on my leather work shoes, or leather Tumi bag. –Dogs on planes should be properly restrained. –Not sure what to do about the doggy bathroom problem. –I do not trust the airlines with my laptop. Therefore, if I were a pet owner, I certainly would not trust them with my pet. Don on ATL, ESA as well as obese people are protected by the ADA and will not be removed. In both cases, if there isn’t another unsold seat for the uncomfortable or complaining passange, they are the one to deplane. Ask your gate agent friend to talk to a COR. That’s exactly why Gate Agents aren’t suppose to handle the situation. A Complaint Resolutions Officer is specifically trained in the legalities. @Wayne — I think you’ve made the best observations in this thread, and I agree with you. If an ESA certification isn’t good enough to get your dog into your local hardware store, it shouldn’t be good enough to get it onto an airplane. Aside from the fact that individuals with service dogs probably NEED their animals with them more, the difference is training. A service dog has been trained to behave in public settings; and ESA dog has not been trained. It seems to me that if you really need an ESA for your flight, your animal should meet the same standards as a service dog –or get an animal that fits in a carrying case. Obviously, such a policy will result in more “nervous flyers,” and perhaps some people who will feel they are no longer able to fly commercially. But when weighing the rights and benefits to all, it seems like the best solution. While I previously suggested an insurance option, I think an outright ban on all untrained animals that cannot be contained in carrying case is the better call. @Ruth I’d counter that with – For some reason you feel you have a “right” to be segregated from all animals, while using what is essentially Public Transportation. Guess what? You don’t. While I understand that you feel the world should be forced to conform to your selfish desires. The Real world don’t work that way. Ask the woman who got kicked out of first class for complaining about an ESA, and had the entire plane applaud her removal. This is really very simple: You dog haters can go on and on about animals not belonging on planes, etc… etc.. It really don’t matter. ESA dogs are allowed on planes, and as employee’s here have mentioned – They aren’t even allowed to question the owner as long as the documentation is legit. This might bother you, but it’s the current reality, and it’s not changing. The only way the ESA situation don’t get worse, is if airlines loosen their pet policy so that more and more people don’t take advantage of the system as it currently exists. If someone is allergic to dogs, or even frightened of them – I can understand and sympathize. I’d willingly move to accommodate them. However, I don’t LEGALLY have to, and the airline can’t force me. The solution to ESA’s is allowing a passenger to buy an extra seat to accommodate his dog, maybe the row if it’s a large one. This gives a buffer, and allows the dog to be separated from anyone else. It won’t completely solve the problem, as some people will still go that route because an ESA dog is free. However, it will lessen it greatly, as it will give people like myself options. My dog is an ESA, because if she is not, she has to fly as cargo. Had I other options, I wouldn’t have bothered. Understand that flying in the hold is NOT a workable option. That’s why you have an influx of ESA’s in the first place. Side Note: Harping on the 50 pound thing is a bit silly. My Basset Hound is nearly 50 lbs, but looks like a small-medium sized dog. It’s just how they are built. I’ve also never had anyone complain or be bothered by her. She’s friendly, and if anything I’ve noticed more people would rather sit next to her, then actual people….. I am an agent of a major airline and I agree that the ESA program is in need of an overhaul. There are people who truly have emotional or mental disorders that benefit from having their ESA, especially soldiers returning from deployments with PTSD. I fear a vast majority is made up of those who just really love their “purse puppies” and have a doctor who is willing to state they are being treated for an emotional or mental illness. One day at work, I was in the ladies room and I overheard one woman speaking to another. One woman commented that she’d love to bring her dogs but it was too expensive. The other woman said these were her ESAs and it was easy to get paperwork for the airline and proceeded to tell her how. I cringed! Then the woman with the dogs continued to tell her that she needed her dogs because her son and daughter were killed recently in a car accident and she couldn’t be without them. There are many fraudulent ESAs out there but with the ADa rules, it’s impossible to know when a dog will be aggressive. What made you think in a perfect world that a privileged and opportunist passenger would follow a rule. Take cellular phone for example. I’ve set to a passenger with 3 cats. Both here and her husband said it’s an emotional support. Which I clearly don’t think it was due to the fact that it was acting up and hair fur all over because they were petting it during beverage service. People take advantage 75 percent all the time. And this is part of the government and those that are responsible for handicapped association. I have pets but as a courtesy and respect for my fellow passengers I would not claim nor even think that a 25 lbs dog and without proper and sufficient training should be on board. For those with real emotional support dog. They know what to do and they will not attacked. Hell a sniffing dog won t even so anything unless it is told. My conclusion is that many passengers claim they are emotionally unstable that’s why they have to have a pet. When clearly 75 percent lies. It’s easy to get a pet pass from a doctor. I know cause I know someone rather than pay for the damn pet. Like I said. Pets will not attacked unless it’s not emotional support. Give me a GD break. People who need “emotional support animals” with them 24/7 need to be committed. Round end up and put in them padded cells (they all have insurance.) And ZERO TOLERANCE on planes. This is horrible and my worst nightmare. I travel with my 2 pets, a small domestic short hair cat and a 10 pound dog. They are model travelers, and most times people don’t even realize they are there. I hate to see people abuse the ablility to travel with a pet. If the airlines decided to ban animals, I would never be able to put my pets in the cargo. My dog is a rescue and only is secure around me or my husband. She would have a heart attack if left in the belly of a huge dark monster. Maybe emotional support animals and their owners should have a special part of the plane, where they are away from petless people. If you can’t leave home because you’re so emotionally unstable that you need a dog to pet, Stay Home and pet your dog in your living room! If you and your dog need to travel, rent an RV or van and Drive! Fake emotional and service animals should be illegal. This is getting out of hand. Would someone please do something about it? Thank you. Signed, EVERYONE IN THE AIRLINE INDUSTRY. An emotional support animal reqires no training .. it is a pet.. that being said they need to be small! I work as a flight attendant.. 20 lb or less (can not sit in your lap if it is bigger than a two year old child). It needs to be on a leash . And it needs to be on the floor and it should not eat or drink on a plane . Think about it . Seeing eye dogs can fit under a seat they do not eat or drink …they do not bark . Also if the airline would allow free airfare for a small dog in a kennel it would greatly alleviate the problem of fake emotional support . And behavior that is unacceptable on a flight. I travel with mine all the time and she stays in her kennel ..,she is not a problem.. people don’t even realize I have her. The problem is a 50 lb dog sitting on the lap of a passenger is quite silly on the airlines part. Delta is ultimately responsible for telling that particular customer, “I’m sorry but unfortunately your dog is over the weight limit allowed for under the seat or on-the-lap flight. You will be required to purchase a seat/or seats next to you for your pet; depending on their size ad demeanor. Your large dog must remain inside a carrier during flight.” That to me sounds like a RATHER EASY SOLUTION to a big problem. It’s not hard for an airline representative to weigh a pet and notice if the animal is displaying aggressive behavior at check in. All the airlines have to do is revise the terminology in the pet requirements and add a clause or two. Emotional support animals & service dogs can experience trauma just like humans and react badly in those situations; especially on a flight. That being said… You CANNOT take one passengers horrible experience and hold everyone else with pets accountable for it. (And that’s whether those pets are emotional support, service, or family pets). I feel very bad for the passenger attacked and would be pissed if it happened to me! I just can’t believe Delta allowed a 50 lb animal on the lap of a passenger!!! I would be mortified if I were shouting next to them! I would’ve asked for another seat or something! It’s ABSOLUTELY ridiculous considering how much we pay for flights, baggage etc nowadays! @ Don in ATL, that may be the written policy but that isn’t what happens when there aren’t any available seats. Being in the industry for almost 20 years, Southwest is currently the only airline that takes a person down to the plane and has them sit with both armrests down, if they don’t go down, they are required to purchase another seat at a discounted rate. The airline you mention doesn’t have this policy and the complaining passenger is the one asked to take the next flight. I have personally witnessed this twice in my career. Also in those years, I can count on 1 hand hour many obese people have purchased 2 seats, yet I see it at least once a trip. @Martin….precisely! The world has gone completely mad. Why on earth should I have to tolerate the nuisance, inconvenience and unpleasant smell of your animal because of your emotional instability? If it’s that serious for you, keep your a$$ at home or drive. Plane rides have become increasingly more uncomfortable. This is just another element to worsen the flying experience. Amazingly almost every comment is either about the rights of pets on planes! To hell with the man who was attacked without provocation. No one gives a hoot about people any more. Give the dogs all the rights while stripping the rights of humans. Gotta love the civilized world we live in. I wish this victim of the dog attack a speedy recovery. Now will he need an ESA to accompany him on his next trip? As a frequent flyer, I pack doggy treats to feed any hungry 50 pound emotional support animal seated next to me. However, when a passenger boards with their emotional support pig, turkey or goat they should always bring their own snacks as their maybe a delay for the flight attendant to visit your seat with the aircraft snack cart. I LOVE taking my dog with me, as much as possible. But….1) I chose a SMALL dog so I could do that, and 2) I DON”T push it. Putting a CHOCOLATE LAB on your LAP for a plane flight????? Are you KIDDING ????? NOT FAIR to the DOG, NOT FAIR to other passengers. And now, even I agree…..too many people are PUSHING IT, with the ESA’s…..!!! I don’t understand the ESA thing and really never will. I believe there are plenty of people who cannot fly because of various conditions, why wouldn’t the need for an animal to be with you be one of those reasons? If truly needed then sufficient training and rules would need to be followed. Flying is not a “right”. I have the right to not be attacked while flying. We have a rule for baggage size and dimensions as well as weight, why do we not have a rule (enforced) for animals flying on a plane. I have a dog and a cat and would love to “bring them along” with me everywhere I go but decency says my right to travel with them does not supersede others rights not to have to travel with them. There are tough and necessary regulations in the aviation industry. As a former mental health clinician, it seems that there are many people out there who need treatment from a credentialed mental health clinician to be independent enough to travel pet free. There are many medications available that can help a person to get from point A to point B on an airplane. I have owned dogs for over 40 years and am not anti animal in the least. But this ESA thing is out of control. I am waiting for a snake or other unpopular animal to come on board as an ESA . Maybe that has to happen for the airlines to finally take control of this situation. What did all of these people who now bring ESAs on board do before ESAs were allowed? Not travel by air? I’m always amazed that fliers seem to jump on any bandwagon, pro-pet, anti-pet, pro-ESA, anti, pro-ADA, anti-fat-people, blah, blah, blah, Quite willing are they to blame their fellow passengers. BUT these same people accept the airlines cramming people into too small seats with too little space between rows. And, the writers glide right over the exorbitant cost of getting a larger seat or taking Amtrak or the fact that “exit row seats” required for safety, have been turned into money-makers for the airlines. People could be accommodated into different seats, rows, areas, whatever, if there were some significant or imaginative variation on seating. Or, for example, if part of our new infrastructure included high-speed trains. Over and over it seems that unrelenting capitalism for the 1% is being accommodated instead of what Americans need and want. If 40% of Americans are overweight and 50% consider pets a part of the family, where is the competition?